By Lauren LaRocca. Illustrations by Marcos Chin. IT’S A SATURDAY AFTERNOON in February, and the Baltimore Symphony Orchestra musicians are performing Handel’s Water Music for a modest crowd. The conductor, concentrating fiercely, bounces her baton in time, while violinists and French horn players occasionally glance up from their sheet music to meet eyes with her. She’ll certainly have a story to tell her friends at the playground next week. 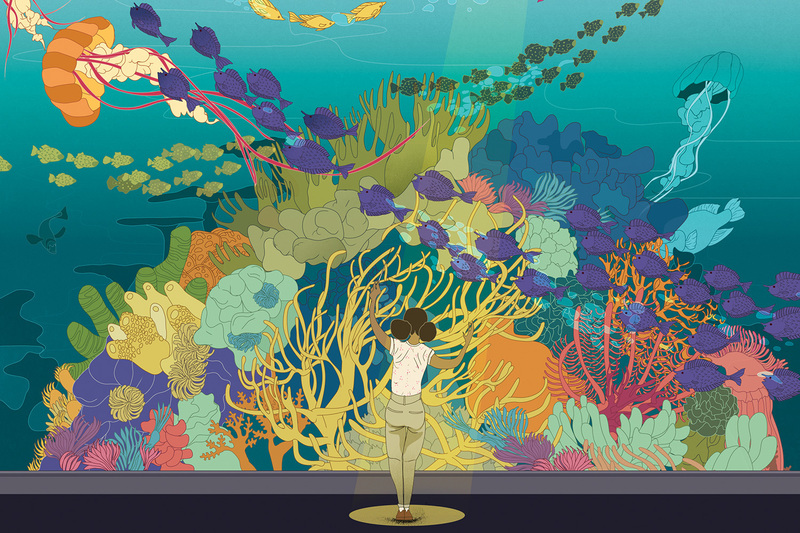 You see, this conductor is no older than 10, and the ensemble is not performing at the Joseph Meyerhoff Symphony Hall but amid a world of glimmering turquoise waters and corals at the National Aquarium. 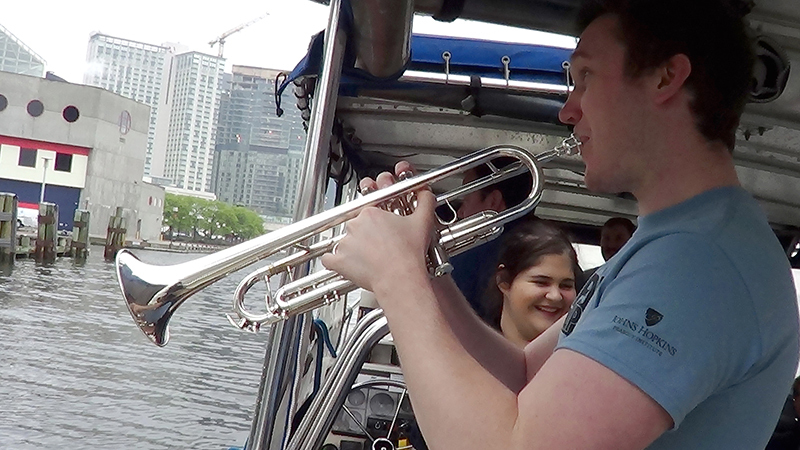 Though a seemingly unusual scene, unusual is becoming the norm for many classical musicians in Baltimore. In an attempt to draw in more diverse audiences and a new generation of musicians, groups such as the BSO, Peabody Institute, Baltimore School of Music, and others have paved new ways to lure listeners to the music—whether it’s pairing it with yoga, performing pop-up concerts in public, playing new works by underrepresented composers, or collaborating with hip-hop artists. 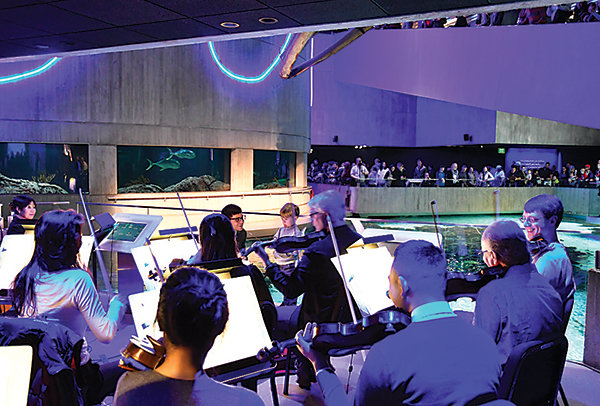 In the case of BSO’s show at the aquarium, visitors were invited to act as guest conductors to see what that feels like. Classical music is timeless—that much has been proved—so musicians and administrators are banking on the fact that it’s the culture that keeps many potential listeners at a distance. Performances did not always conjure up images of formal attire and etiquette—musicians wearing coattails and white bow ties for daytime concerts, black bow ties at night. Symphony attendance has been dropping across the country for decades, although some local initiatives show promise. Attendance for BSO’s Off The Cuff series, for example—which includes an informal talk with BSO music director Marin Alsop, a condensed concert format, and an after party—has increased by 46 percent since it began in 2008, and nearly 40 percent of those ticket buyers are under the age of 40. 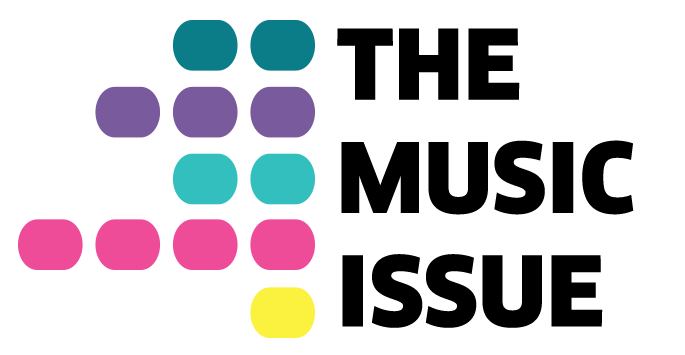 Its Pulse series, launched in 2015, consistently attracts young audiences. Several people are determined to push this music forward into the 21st century. And the goal is not to merely make it more accessible. After all, in the digital age, music—and pretty much everything—is accessible at the touch of a screen. Rather, musicians are striving to create doorways into the music so that they can enlighten us as to why it’s still vital and relevant while creating the next generation of lifelong music fans. 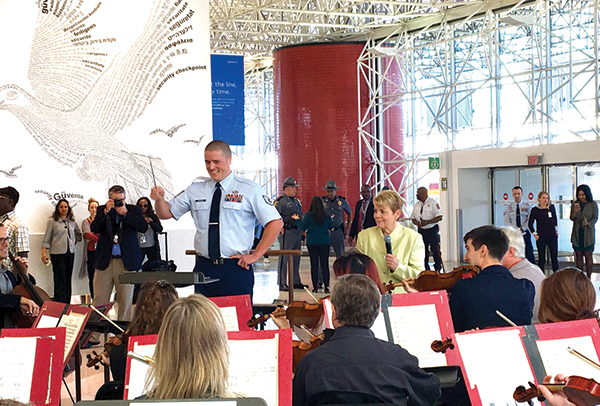 BSO at the National Aquarium. valerie june, backed by the bso at a pulse show. 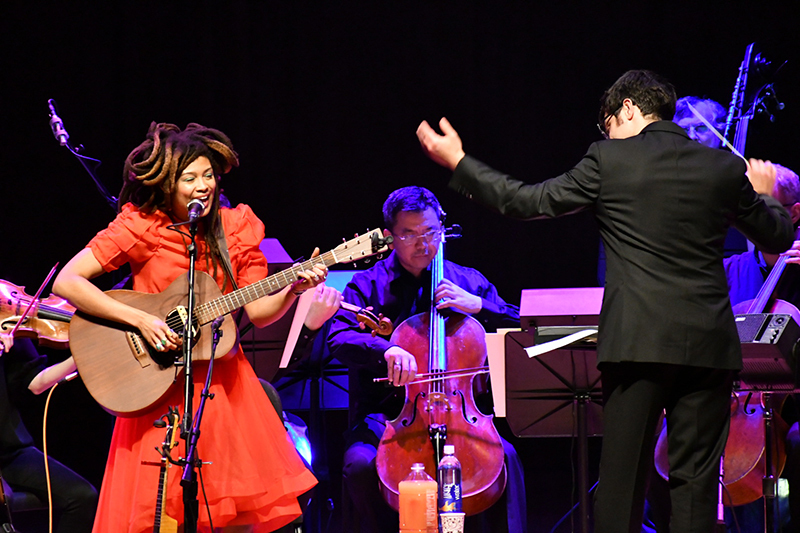 When the BSO performs Tchaikovsky’s “Souvenir de Florence” at the Meyerhoff in March, they’re essentially acting as the opener for Valerie June, who then takes the stage in a showy red dress, dreadlocks piled on top of her head, and belts out her soulful Appalachian vocals over guitar and banjo. But then something even more interesting happens: In a third and final set, June is backed by the BSO, which plays full arrangements of her songs in a magical collaboration. In partnership with 89.7 WTMD, BSO’s Pulse series is conducted and co-curated by BSO associate conductor Nicholas Hersh, who has given a lot of thought to how to make classical music more palatable for his generation, the millennials. 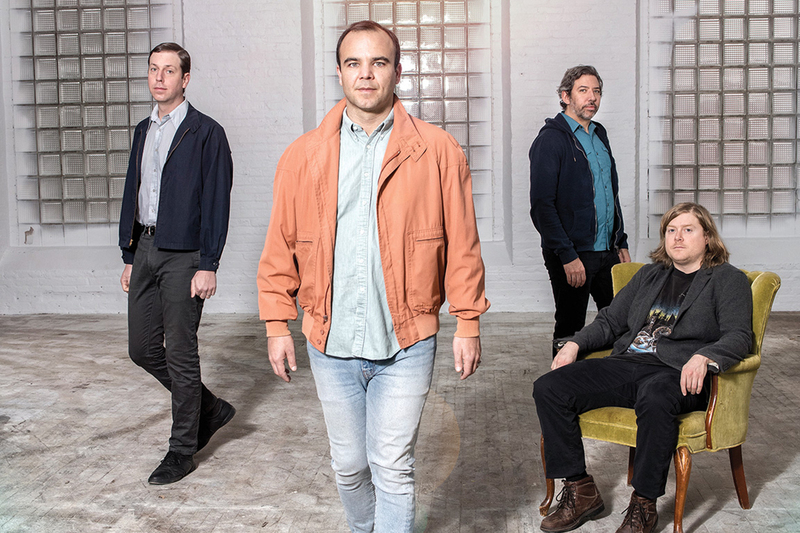 It started as an experiment: pair a classical piece with an indie artist—not necessarily a piece that fits snugly, but something related by general sound or feeling. For example, June is a passionate, wear-your-heart-on-your-sleeve kind of singer-songwriter, so Hersh looked for a composer of similar essence. The idea is that people will come for the indie act and in so doing might discover a classical piece. Peabody in Mount Vernon is the oldest music conservatory in the U.S., and it prides itself on keeping tradition alive and training musicians in a manner that’s tried and true. But in recent years, staff and students alike have found ways to extend their reach beyond the walls of the prestigious institution, challenging the very idea of what a conservatory is. One way students have done this is through mini concerts in unexpected places—a water taxi, City Hall, even right on the sidewalk. Content has pushed tradition, too. In February, Peabody Chamber Opera performed Out of Darkness: Two Remain, based on the true stories of two unlikely Holocaust survivors—a homosexual Protestant man and a political prisoner who hid her identity. Also new: An online music tech class that prepares students for ways in which technology can enhance their careers and Wendel Patrick’s hip-hop class, where students learn the history of the genre and work on their own material. As Darin Atwater, an accomplished Baltimore-based conductor and pianist, moved through the world of classical music, he began asking himself why American symphonies weren’t really dealing with our country’s native music, and why our classical music is still so very Eurocentric—from Mozart’s Austrian folk themes to Tchaikovsky’s Russian folk music. Why were we not looking to jazz and hip-hop and gospel and blues? In 2000, he took it upon himself to form an orchestra of predominantly African-American and Latino members dedicated to performing American music. Though he had no point of reference because there weren’t—and still aren’t—any other groups like it, Atwater founded Soulful Symphony, which is now 85 members strong. Their original compositions showcase rhythmic songs with a vibrant brass section and gospel choir vocals. 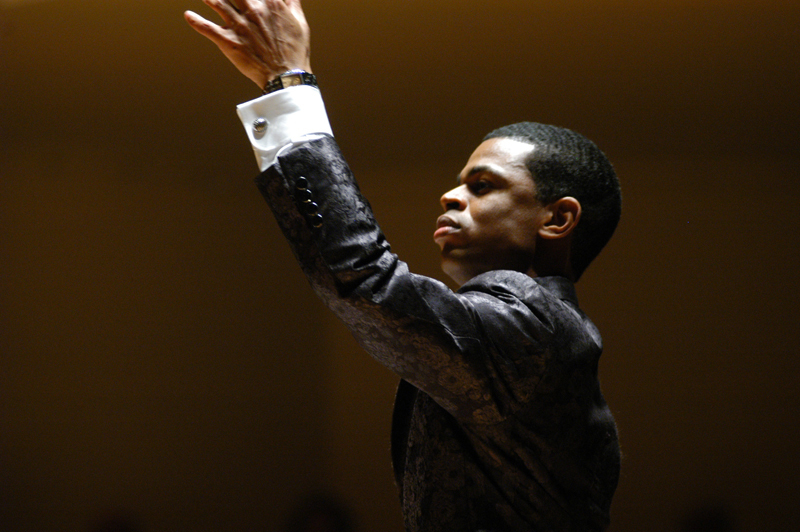 In 2007, Atwater led the group in a hip-hop symphony. Classical guitarist James Lowe at Sherwood Gardens. James Lowe has three degrees in music, lives and breathes it, but still gets bored at formal orchestral concerts. He knows how insular that world is. He started the Baltimore School of Music in 2012 to give all ages the opportunity to learn to play classical music in a casual, non-competitive environment. 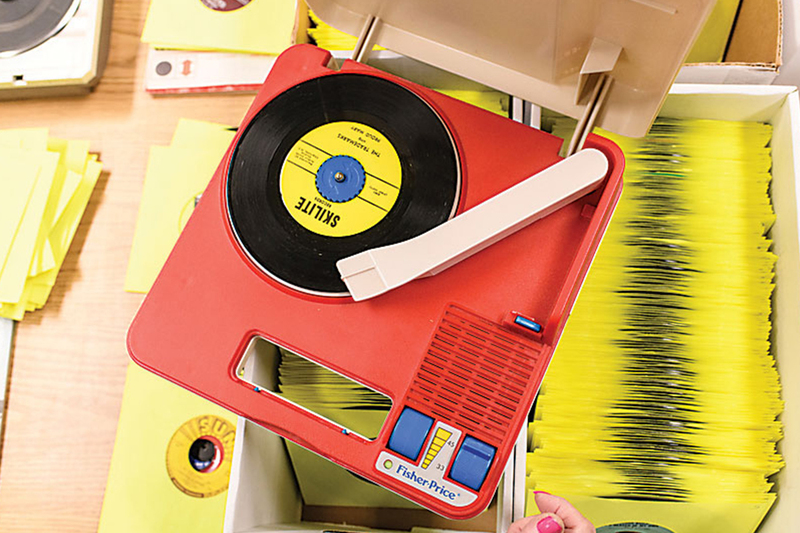 Instructors aim to find ways into the music that are fun and engaging. For example, Lowe played the beginning of The Beatles' song “Blackbird” to show students that it was derived from the 1700s classical piece “Andante in G” by Ferdinando Carulli, which they then learned. 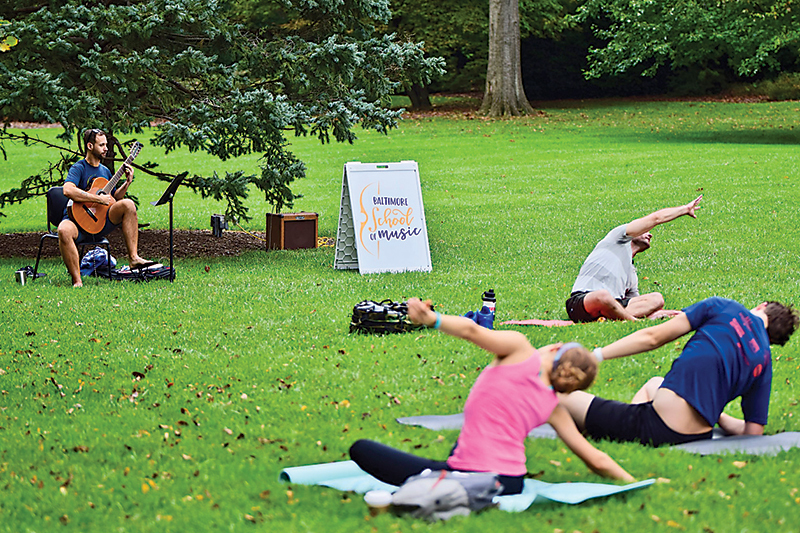 Students also perform in unconventional places—for example, alongside a yoga class at Sherwood Gardens and, this month, at Monument City Brewing Company, right next to the fermenters. Symphony Number One is a chamber orchestra that formed three years ago to showcase substantial new pieces through performances, typically at churches in Baltimore, and live recordings. Smith is mindful of including underrepresented, diverse artists. Symphony Number One performances often include a piece by a traditional composer—a dead white guy, as Smith puts it. To some, this is like eating your vegetables before dessert. But when they do indulge in that contemporary piece, it’s often surprising and full of flavor. 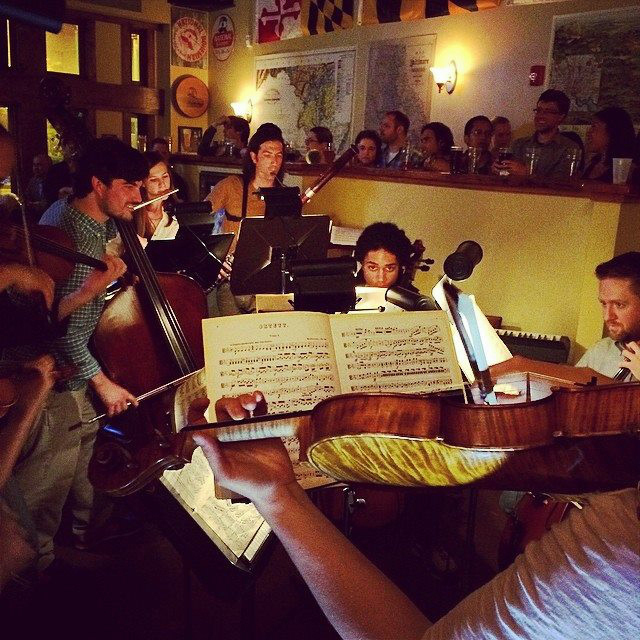 Peabody alumnae Rafaela Dreisin and Stephanie Ray started the Baltimore chapter of Classical Revolution, a casual open mic for classical musicians to gather and perform at nontraditional venues. Duos and small ensembles—on strings, wind, and brass—play chamber pieces new and old, then wrap up the evening with a jam. Sometimes there are opera singers. Sometimes hip-hop artists join in. Sometimes people just show up and courageously sight-read. Their first event, at the now-defunct Bohemian Coffee House in 2011, was packed, and they’ve gone on to host gatherings at Joe Squared, The Windup Space, The Reginald F. Lewis Museum, and The Bun Shop, to name a few. One was simply a Spotify playlist listening party at The Crown. Mind on Fire, a chamber orchestra "family" of about 18 players led by James Young, formed in 2017 to perform music by diverse living composers. In their short time together, they've made music with and performed alongside over 50 artists-somatic artists, poets, puppeteers, actors, filmmakers, and a large array of musicians, including Dan Deacon at his 10th Anniversary Spiderman of the Rings show last fall. On May 19, they'll premiere Brooklyn-based composer Elori Saxl Kramer's work for orchestra and electronics "The Blue of Distance" at EMP Collective. Composer and Peabody Institute faculty member Judah Adashi founded the Evolution Contemporary Series in 2005 and serves as its director. He's presented work by more than 75 composers and has featured world-renowned guests. 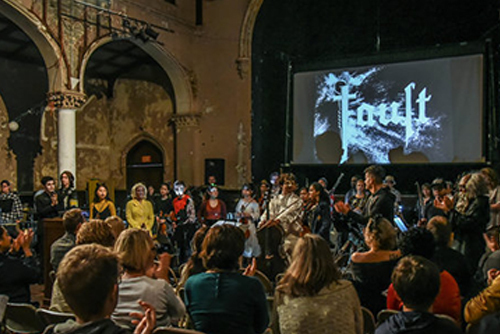 In its current season, the series has showcased composer, singer, and pianist M. Lamar's multimedia song cycle Funeral Doom Spiritual, a radical exploration of the African-American spiritual tradition, as well as chamber works by Bryce Dessner, the guitarist in The National. Concluding the season on May 8, Baltimore artists including Adashi, Outcalls, Joy Postell, The Witches, Ellen Cherry, Brittani McNeill, Shodekeh, and Sophia Subbayya Vastek will perform from the 2017 release Bjork: 34 Scores for Piano/Organ/Harpsichord & Celeste in a concert they're calling The Björk Songbook at An Die Musik. "The concert will honor the voice-plus-keyboard arrangements created by Björk and her collaborator Jonás Sen," Adashi explains, "while leaving space for these extraordinary local artists to bring their own interpretive instincts to bear on the music." What better way to get the kids hooked on symphonic music than through video game themes? Musicians in the Baltimore Gamer Symphony Orchestra, which runs through the Baltimore County Department of Recreation and Parks, are able to join without auditioning and play to have fun, usually performing publicly twice a year. "It's a really safe environment for blooming musicians or rusty musicians," says founder and director Kira Levitzky, who finds video game songs online and arranges the music herself. 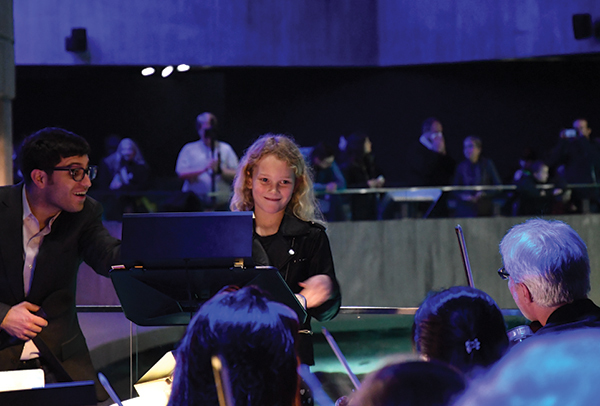 The orchestra bridges a gap between classical music and popular culture. The music is a means to escape, like a video game itself, she says. "When you play a video game, it becomes your world, and you are part of the story." Music in the Stacks was born in 2017 when Peabody students planned a free, after-hours show inside the George Peabody Library. They worked in some talking points and interactive elements, wanting to engage with their audience, and catered the program's content to tie into the library itself. They were hoping for 50 to 70 people to show up; they ended up ushering in a few hundred. A second show proved to be just as successful. "Every time I've played in orchestras, I've felt like there's a disconnect between the audience and performers," says Sam Bessen, 25, founder and artistic director of the series and a 2017 graduate of Peabody's master's program. "Being [Peabody] students, we thought that library had a lot of potential. It's just such a beautiful room." Those first two shows were a trial run, used to gauge community interest. When it returns for an official season, tentatively beginning this summer, the series will be called, simply, In the Stacks, opening up performances to additional artistic disciplines (drama, art, dance, film, etc.). As before, the shows will be held during the library's off-hours and admission will be free, though a $10 donation is suggested to pay the musicians. Bessen is already brainstorming a theatrical production whose stage might be on various library levels, or live music played as the score of a silent film screening. Scenes from the Occasional Symphony. 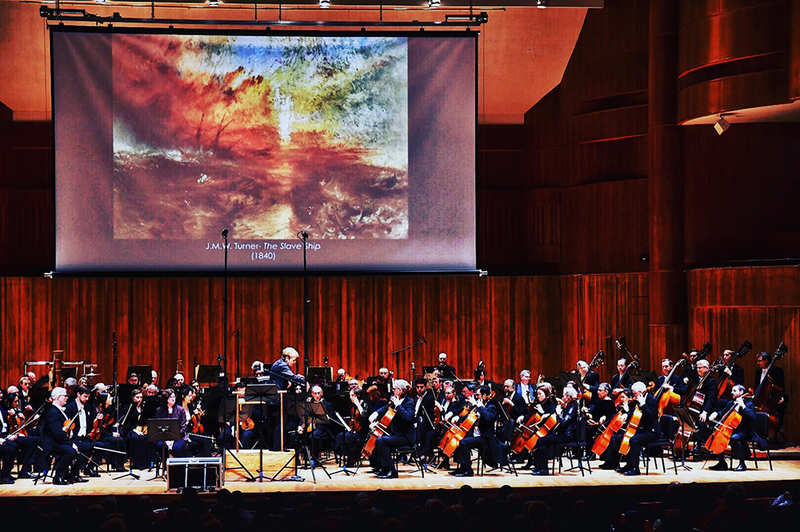 Occasional Symphony has made it part of its mission to bring classical music "out of the concert hall and into the city," says its board president, Elisabet Pujadas. They find intriguing venues and settings to house their concerts. She is most proud of their Halloween shows at 2640 Space. 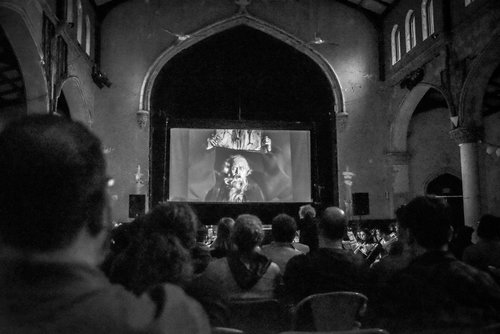 At these flagship events, the orchestra and audience members come in costume for a screening of a black-and-white horror film set to a score that combines classical pieces with those by contemporary composers. The next one is slated for Oct. 31, 2018. 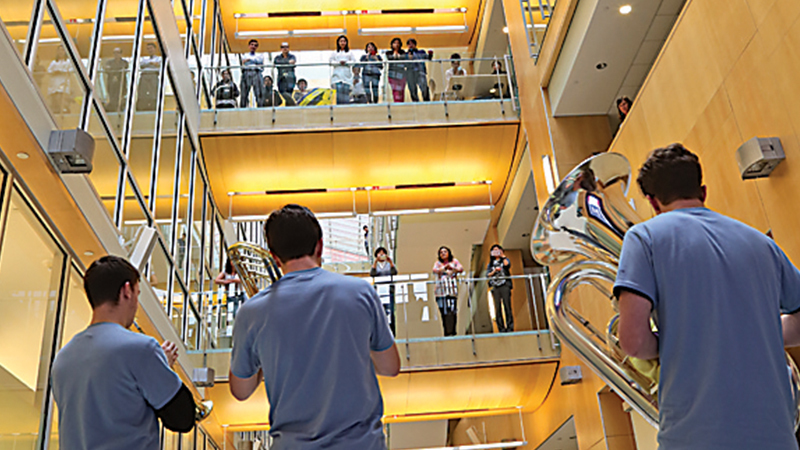 Since their founding in 2012, they've also hit the Port Discover Children's Center, Mari Luna Bistro, and the Turner Auditorium on the campus of the Johns Hopkins Hospital. 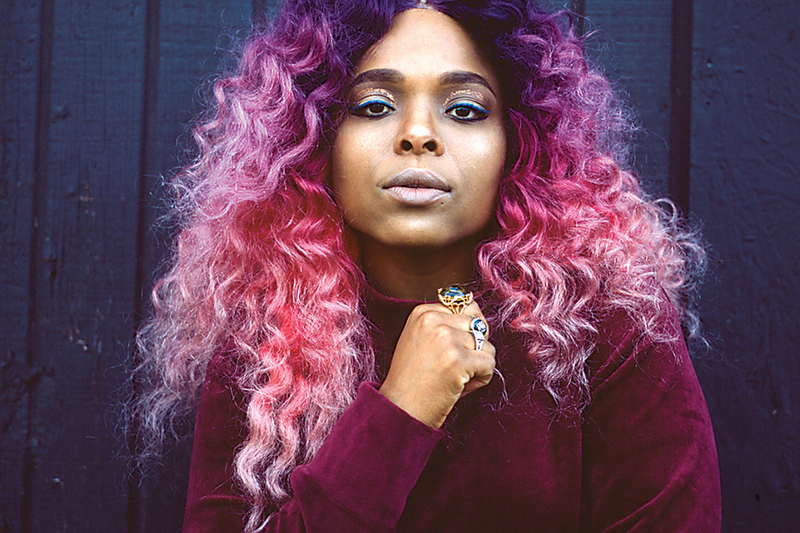 We've rounded up the 50 best local artists to know right now.